Kyoto University researchers have designed a temperature-controllable, copper-based material for sieving or storing gases. The principle used to design the material, described in the journal Science, could act as a blueprint for developing nanoporous materials with a wide variety of energy, medical and environmental applications. The porous nanomaterials that are currently used for gas separation and storage are not tuneable because their pores are persistent and rigid. Susumu Kitagawa, Nobuhiko Hosono, and their colleagues of Kyoto University's Institute for Integrated Cell-Material Sciences (iCeMS) wanted to find a way to dynamically change pore sizes in this type of material. 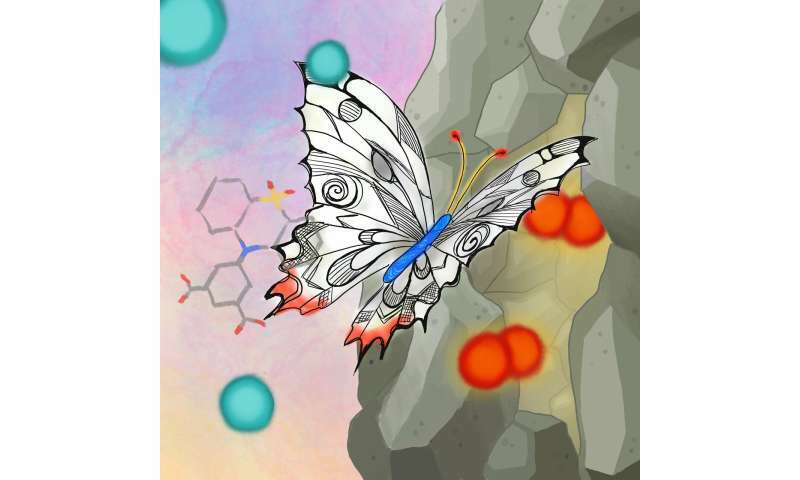 They designed a porous coordination polymer that was formed of copper atoms linked by butterfly-shaped ligands made from isophthalic acid and phenothiazine-5,5-dioxide. The resultant material was composed of tiny nanocages, each with eight protruding channels. At very low temperatures, the channels connecting the nanocages were so narrow that they were effectively closed. As the temperature increased, the channels progressively widened, allowing gas molecules to move between the cages. The team found that a gas could move or become locked within the material depending on the size of the gas's molecules and how wide the material's channels were at a given temperature. They also found that the material adsorbed a gas at high temperatures and held it in when ambient temperatures were applied, effectively storing the gas. Furthermore, when the researchers applied gas mixtures to the material, they found they could separate the gases based on the temperature applied. For example, the material selectively adsorbed oxygen when a gas mixture of equal concentrations of oxygen and argon was applied for one hour at a temperature of -93°C and a pressure of one bar. The material selectively adsorbed oxygen even when the argon concentration in the mixture was significantly higher than that of the oxygen. "The presented porous system that uses a robust framework with thermally active molecular functionality realizes temperature-regulated gas adsorption/desorption by design, in which local flexibility at the aperture plays a pivotal role," the researchers conclude.